Fantasy Football: Quarterback Start/Sit Rankings (Week 6) - Fantasy Football, Fantasy Football Rankings | Mac Bros. Here they are—Fantasy Football Quarterback Rankings for Week 6 (2010) to help you decide who to start and who to sit on your fantasy football team. 1. 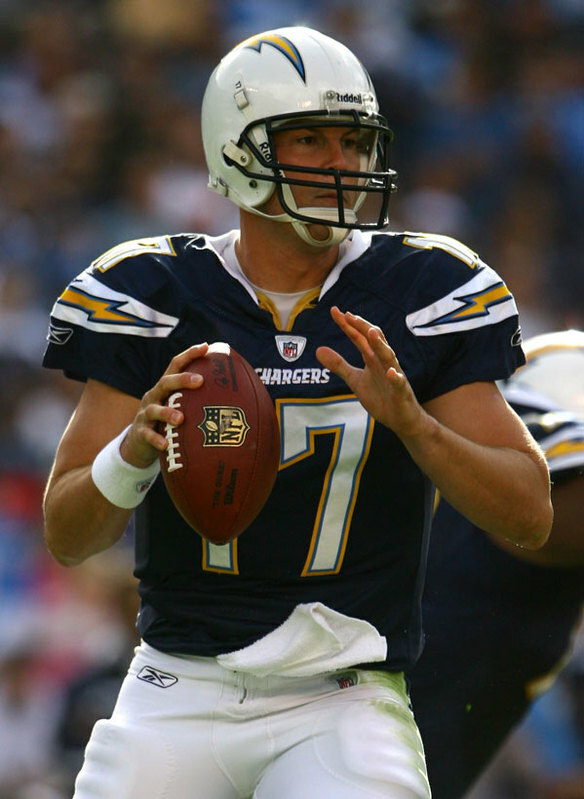 Philip Rivers (SD) - He’s averaging over 350 passing yards per game. He has yet to throw fewer than 2 TD passes in a game all season and he is facing a shaky St. Louis pass defense that was torched by Detroit’s Shaun Hill just last week. Rivers is practically a lock for fantasy success in week 6. 2. Peyton Manning (IND) - It couldn’t last forever and even the great Peyton Manning is not above the occasional rough outing. We fully expect him to come out firing early and often in week 6 especially with all 3 of the Colts RBs battling injury. Manning should bounce back in a big way against Washington’s 30th ranked pass defense. 5. Tony Romo (DAL) - Just as we thought, Romo took his lumps against the Titans in week 5 and mistakes were made, but he was able to more than make up for it with a monster fantasy effort otherwise. In week 6, he will face a solid Minnesota pass defense that currently ranks 6th in the NFL against the pass. The silver lining is that recent injuries in the Vikings secondary make them very beatable through the air in week 6 and Minnesota’s surprising lack of sacks so far this season also bodes well for Romo. 6. Kyle Orton (DEN) - Heading into week 5, the Baltimore Ravens were by far the top ranked defense in the NFL against the pass. Thanks to Kyle Orton, they now rank 2nd. That pretty much says it all about the kind of season Orton is having. In week 6, he will face the Jets. While the Jets are a dangerous defense in general, they have seriously struggled against the pass so far this year. Orton’s ability to spread the ball around to his many capable receivers makes him nearly impossible to shut down and we expect him to keep the momentum rolling. 7. Joe Flacco (BAL) - While Flacco has just one game with more than 1 TD to his credit so far this season, you have to like his chances to double up in that area in week 6 against the Patriots 28th ranked pass defense. The New England secondary have been the poster children for poor coverage so far this season which has led to 9 passing TDs against them in just 4 games. Boldin, Mason, Housh, Heap and Rice will be far more than they can handle en route to a solid fantasy day for Flacco. 8. Eli Manning (NYG) - Manning’s week 6 match up against the 24th ranked Detroit pass defense bodes well in many ways, but it does have a couple of drawbacks. The Lions have amassed 7 interceptions and 14 sacks through 5 games and with Manning heavily prone to both interceptions and sacks, this game may not be the total cakewalk fantasy owners are hoping for. That said, the pros still heavily outweigh the cons and Manning is capable of putting up great numbers against this defense. 9. Ben Roethlisberger (PIT) - There is a rust factor to consider and while he may look amazing in practice, it isn’t quite the same as playing in a live NFL game. Regardless, Roethlisberger probably deserves to be ranked higher going against an extremely vulnerable Browns secondary in week 6 and we suspect he will start off his 2010 fantasy campaign with a bang. 10. Tom Brady (NE) - There is room for skepticism regarding Brady’s fantasy value for week 6. After all, he no longer has Randy Moss and he will be facing a Ravens pass defense that ranks 2nd in the NFL. That said, Brady was an outstanding fantasy QB before Randy Moss came to New England and we suspect he will remain in that category now that Moss is gone, just to a slightly lesser degree. Brady still has a very capable cast of receivers to spread the ball around to and the addition of a familiar face in Deion Branch doesn‘t hurt either. As for the match up, there is no denying that Baltimore presents a tough challenge, but Kyle Orton was able to hit them up for 314 yards and a pair of TDs just last week, so Brady’s chances of doing some damage here aren’t half bad. 11. Jay Cutler (CHI) - He is coming off of a concussion and a night we are sure he would like to forget. Hopefully, the concussion did that for him, but if not, a favorable match up against Seattle’s 31st ranked pass defense should do the trick. 12. Matt Schaub (HOU) - He is in a bit of a funk and facing a Kansas City defense that gave Peyton Manning fits in week 5 could present a challenge. That said, Andre Johnson is close to full strength, the Chiefs still rank just 25th in the NFL against the pass and Schaub has not forgotten how to throw a football. Advantage Schaub. 13. Vince Young (TEN) - It is difficult not to love Young’s chances for success in week 6 against fantasy football’s most generous pass defense, but Young has a history of disappointing fantasy owners even in the most favorable of match ups and while we are betting that he will light Jacksonville up on Monday night; that doesn’t necessarily make it a lock. 14. Mark Sanchez (NYJ) - Thanks to several heavy downpours and his receivers inability to hold onto the football, Sanchez fantasy output suffered much more than it should have in week 5. He should rebound with a solid effort in week 6 against a beat up Denver defense. 16. Matt Ryan (ATL) - While Ryan is extremely capable of doing damage against almost any defense, his performance of late leaves plenty to be desired. Thus, we have some reservations with regard to his week 6 fantasy value. On the road, against an Eagles pass defense that ranks 8th in the NFL and features some of the most brutal blitz packages the NFL has to offer just doesn’t sound like the safest bet to us given Ryan‘s recent level of play. 18. Kevin Kolb (PHI) - He has everything he needs to be successful in week 6, but so does a Falcons secondary that has allowed just 5 passing TDs in 5 games and leads the NFL with 10 interceptions. Kolb has yet to prove he can put up top flight fantasy numbers and it will be difficult for him to so against this defense. 19. Matt Cassel (KC) - It’s difficult to decide which is worse, the Houston secondary or Cassel. There is room for optimism with this match up, but if you’re expecting Cassel to single handedly put your fantasy team over the top in week 6; you are probably in trouble. 20. Alex Smith (SF) - The Raiders have given up exactly 2 TD passes to every QB they have faced so far this season, so you could do worse than Smith in week 6, but there are probably safer options available. 21. Chad Henne (MIA) - Henne has been hit or miss so far this season. Unfortunately, his misses have all been on the road which is exactly where he will be in week 6. Green Bay is a bit vulnerable with so many injuries on defense, but it’s still a tough environment to play in and Henne lacks the consistency to be trusted as a QB1. 22. David Garrard (JAC) - He has been solid in his last 2 games, but that trend isn’t likely to continue against a ridiculously potent Titans pass rush in week 6. 23. Josh Freeman (TB) - He’s getting better by the week, but he is still prone to making mistakes and there probably isn’t a better defense in the NFL at making QBs pay for mistakes than the New Orleans Saints. 24. Shaun Hill (DET) - He has been among the best fantasy QBs in the NFL in 3 of the last 4 weeks, but a match up against a Giants defense that has brutalized two of the NFL’s better QBs in each of the last 2 weeks should bring the joy ride to an end and you are best served exploring other options in week 6. Calvin Johnson is nursing a shoulder injury as well which further cripples Hill’s fantasy value in this match up. 25. Jason Campbell (OAK) - He had some bright spots in week 5 and the Niners pass defense doesn’t exactly qualify as top flight, but Campbell is still a risky fantasy option at best.